Max Kinahan scored a minute from time as Upper Beeding Football Club were denied victory at Southern Combination League Division 2 leaders Bosham on Saturday. Harry Smith’s effort less than a minute after half-time fired Beeding into the lead, but Kinahan’s last-gasp goal ensured it finished 1-1 at Walton Lane. Despite being denied all three points, Upper Beeding boss Josh Baldock was proud of his side’s display. He said: “We’ve played Bosham twice now and they are by far the best side we’ve faced. We went to them with a game plan and it worked for the majority of the game. Beeding’s last game came on January 2, so after 26 days without a fixture, they returned to action. Few chances fell for either side in the opening 45 minutes but Beeding went closest to taking the kead. Smith fizzed a ball across goal but Jamie Rowland could not quite get a finishing touch. Beeding made a blistering start in the second half and went ahead. Alfie Capper dispossessed Bradley Miles in midfield and he then slotted in Smith, who fired past Kieran Magee. 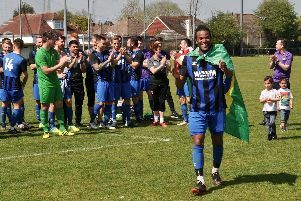 Having lost just once all season, Bosham piled pressure on Baldock’s side -hitting the post and crossbar - before Kinahan grabbed a levelled a minute from time. Beeding host an in-form Rustington in the league on Saturday. UPPER BEEDING: Broadfoot; Trower, Donaldson, Dermott, Lawrence; J.Rowland, Capper, Bacon, Townley, N.Rowland; Smith. Subs: Whittington (J.Rowland, 70), Tapscott (N.Rowland, 75), Hatchett (Smith, 86), Skinner.